This episode gave us a handful or realizations, a few from characters and a few for us as the audience. Charming realizes that just because they lost one battle with Emma’s darkness does not mean she is doomed. Hook realizes that Dark Swan is not his Emma and he has to stop seeing her as if she is. And we realized that Arthur has some dark plans and is not someone we can fully trust. The episode starts with the group finding a toadstool in one of the spell books that will allow them to talk with Merlin. (Quick side note, that question mark Regina put in the book was that some subtle hint that she thought something would happen to them later?). Of course this toadstool is in a very dangerous land and Charming volunteers to go off to find it. Arthur asks to join him in his quest. In the present we see that Charming is beyond frustrated at the situation the group currently finds themselves in. He is blaming himself for not having saved Emma from the darkness. He is feeling helpless. The real reason for his frustration is seen in the flashback. Charming doesn’t want to be the man remembered for kissing awake a princess. He wants more for his legacy. He wants to bring change to the world. He feels like he is losing that side of himself. He is concentrating on what he has lost and how, instead of moving forward from those losses. After Arthur and Charming, “lose,” the toadstool Arthur tells Charming that what makes them heroes is that they are brave enough to move forward even when they do experience a loss. They do not give up. Charming learned that in Camelot and he needs to remember it now in the present. Yes, the group failed to save Emma from succumbing to the darkness inside of her. But they have not lost this battle yet. As we saw last episode the Emma we know is still in this dark version. We have not completely lost her. Charming and the rest of the group have to stop concentrating on what they have lost and focus on saving the light that still lives inside of Emma. Charming does not remember what happened. He has no idea who is to blame for Emma taking control of her dark powers. No one knows what exactly happened and they have to stop blaming themselves. They have to move past that moment and figure out what they have to do now in this time to not fail again. Arthur is another man intent on not failing people he cares about. Arthur showed his true colors in this episode. Arthur is not the humble and kind man he appears to be to the group. He has one face he shows the public while the other one is conniving and manipulating in order to get what he wants. Arthur is not afraid to hurt anyone if it means that he saves his people and Camelot. He steals the toadstool from Charming. He poisons his squire in order to keep him from spewing his secrets to the group. It is difficult to be able to have a real judgement of Arthur. Arthur has his blinders on. He does not trust our group. 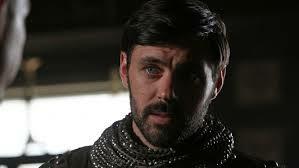 He does not trust anyone outside of Camelot. He will do anything to save his people which is a scary thought. No one will stand in his way. Arthur believes what he is doing is right and what is needed to save Camelot. That is the scariest part about him right now,. He refuses to see that his choices are hurting other poeple. He does not think about what consequences his actions are going to have for anyone else. Nothing else matters at the moment and he is going to hurt someone beyond repair this way. He is going to lose Camelot because he is going to lose everyone’s trust. You can only manipulate a situation for so long this way until things fall apart. People are going to be afraid of him and he is going to fall apart in the process, scared of himself. Our group will understand his actions but they will not forgive those actions. The other major character that has a waking moment in this episode is Hook. Emma brings Hook to her and tries to pretend that they can be the same as they were before she became Dark Swan. We all know she is manipulating him and he is not dumb enough to believe her. She tries to tell him that she is still the same woman he knew, that all she has lost is her fear. And she does have a point. She still has some of her same traits but that lack of fear is what is hurting her. She no longer fears consequences or her actions or decisions. She does whatever she wants without thinking twice and that scares everyone else. Hook tries to pretend for a minute but he can’t. He can’t see Dark Swan as Emma. There is a poignant and important moment in this episode. When Emma asks Hook if he loves her he answers that he loved her and then calls her the Dark One. This is a huge step for Hook. He has now drawn a line in the sand between himself and her. He will no longer pretend that she is the woman he loved and knew before. He is not blinded by his love. He will not let her play with his emotions. He has to do this. He has to be able to separate himself in order to find a way to bring back his Emma. In the beginning he was so wrapped up in his emotions and desperation that he wasn’t thinking clearly. I said before that he had to find a way to tamper down his emotions in order to be any help to Emma. This is one way for him to do that. He had to put the two women in two separate places. Now he can concentrate on bringing back the Emma he once knew. Saving Emma is gong to take some desperate measures and sacrifices and now he can clearly think about what all of that means and be able to take the necessary steps needed to save her. “Word quest means to seek not to find. The seeking is what matters,” – Arthur – They are seeking a way to save Emma. They are going to go through trials and tribulations along the way. They are going to learn lessons and I think the combination of what they learn is going to be what saves Emma in the end. What is Arthurs full plan? What will recombining Excalibur and the dagger do for him? Will it help or hurt? Is this man really Lancelot? Why doesn’t Lancelot trust Arthur? What does he know? The question mark in the book did Regina purposely put it there for a reason? Did she have a feeling something was not right about the whole situation? Will Arhtur ever use the toadstool? Can Emam really turn Rumple into a hero? What would that even entail and mean? Will Belle find Rumple and be able to still love him and help him? What effect will Emma being The Dark One have on all her relationships when she is back to normal? What will Rumple be like now? Will Zelena’s baby be a rift between Robin and Regina? Will Zelena be able to ever be in her child’s life? Will allowing her in its life be a way to change her for the good? Posted on October 12, 2015, in Once Upon a Time, Tv Shows and tagged Arthur, Charming, Emma, Hook, Once Upon a time, siege perilous, spoilers, tv show review. Bookmark the permalink. Leave a comment.